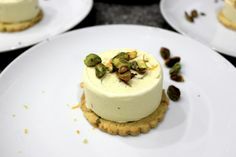 Skate at Somerset House with Fortnum & Mason. Photo by James Bryant. It’s that time of year again! The festive season is fast approaching in London and the city is about to undergo its annual winter transformation. 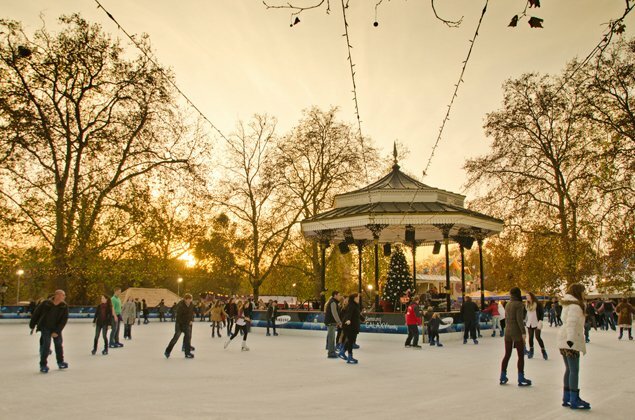 From mid-November all the way up into the new year, Londoners and visitors alike are treated to a menagerie of festive markets, amazing holiday sales and perhaps best of all, ice rinks! From stately palaces to city squares, read on to discover the best places to skate this winter in London. As easy walk or Tube ride away from many of our holiday apartments, the ice rink at the Natural History Museum is arguably the prettiest in the city. The museum, which is one of the finest examples of Romanesque Revival architecture in the UK, provides a stunning backdrop to the 1,000 square metre rink. The surrounding trees adorned with fairy lights only make it that much more magical. A smaller rink for young children adjoins the main skating area, and the museum also offers a carousel and a Café Bar serving everything from hot chocolate to mulled wine to complete the experience. 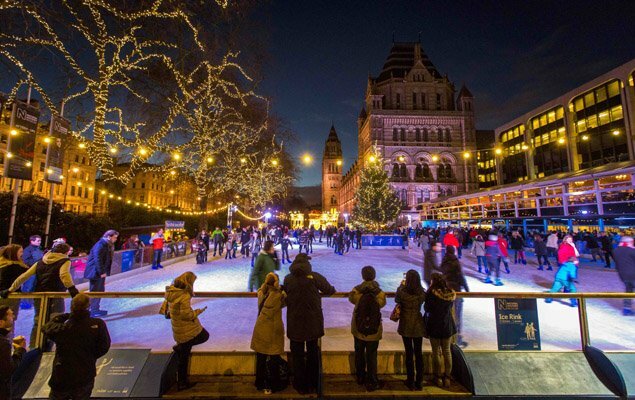 Find out more about the Natural History Museum Ice Rink. Night view of Somerset House ice rink in Strand, London. In November the vast courtyard of the stately 18th-century Somerset House in central London transforms into a veritable winter wonderland. At the centre of it all is a 900 square metre rink, which offers family-friendly skating by day and transitions into a nightclub on ice at night with a live DJ. 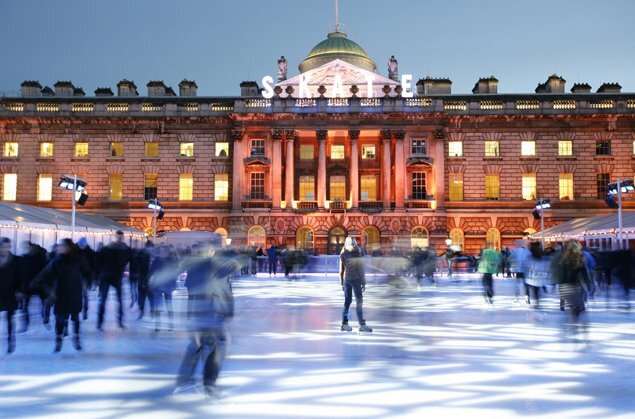 Somerset House gives visitors the unique opportunity to combine a skating session with a little holiday shopping. Each year the rink partners with Fortnum & Mason and the legendary London department store sets up a pop-up shop on site offering some of it finest festive gifts and decorations. 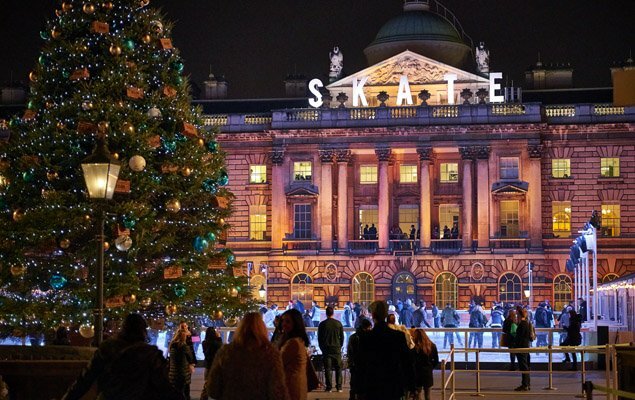 Find out more about Skate at Somerset House with Fortnum & Mason. 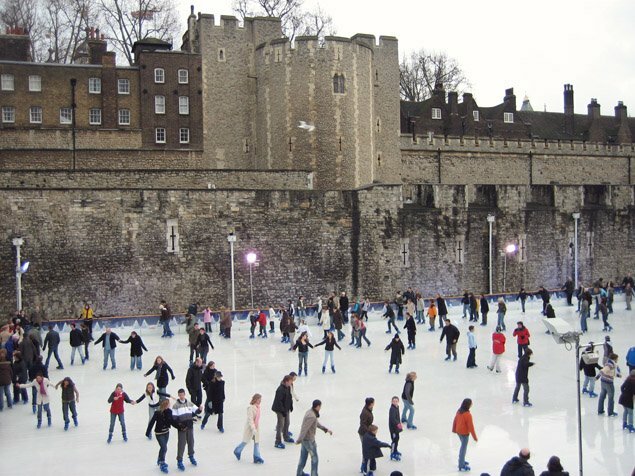 The 1,000-year-old Tower of London provides a grand and historic backdrop to its ice rink. Offering the unprecedented opportunity to skate in a fortress moat, skaters can glide right alongside the tower’s imposing stone walls. For non-skaters, the neighbouring cafe offers traditional winter warmers, including fresh soups and pies, hot chocolate, mulled wine and more. Find out more about Ice Skating at the Tower of London. 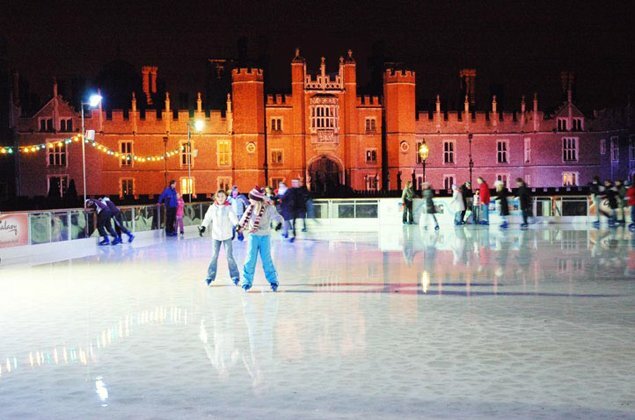 The Hampton Court Palace Ice Rink with the famous and magical West Front façade as a backdrop for skating. 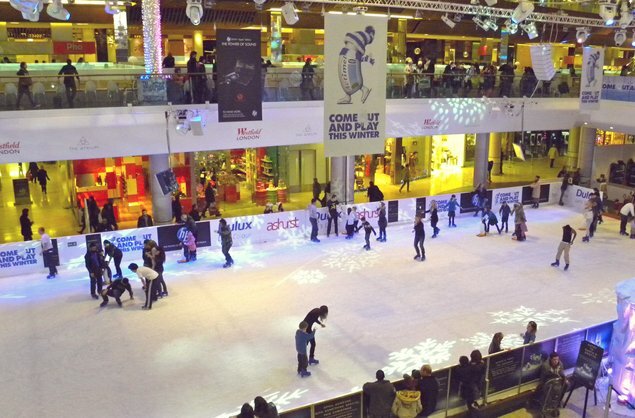 This year the ice rink will open on Saturday 2 December 2006 for six weeks. Hampton Court Palace lies 35 minutes outside of London by train and is an excellent day trip destination for winter visitors to London. The 500-year-old regal home was a favourite of Henry VIII, and each year thousands of visitors enjoy skating in the palace’s garden. Relax after a skating session at the rink-side Ice Bar and Café or spend the rest of your day exploring the magnificent interiors of the palace. Find out more about ice-skating at Hampton Court Palace. Hyde Park Winter Wonderland is London’s favourite annual winter carnival. 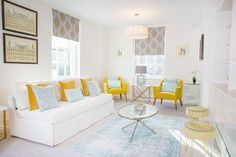 This is very much a family-friendly destination with plenty of restaurants, rides and shopping opportunities. Of course, the real highlight of Winter Wonderland is its magnificent ice rink. Set around a beautiful Victorian bandstand, the rink is illuminated by a canopy of 100,000 fairy lights. Find out more about Hyde Park Winter Wonderland. 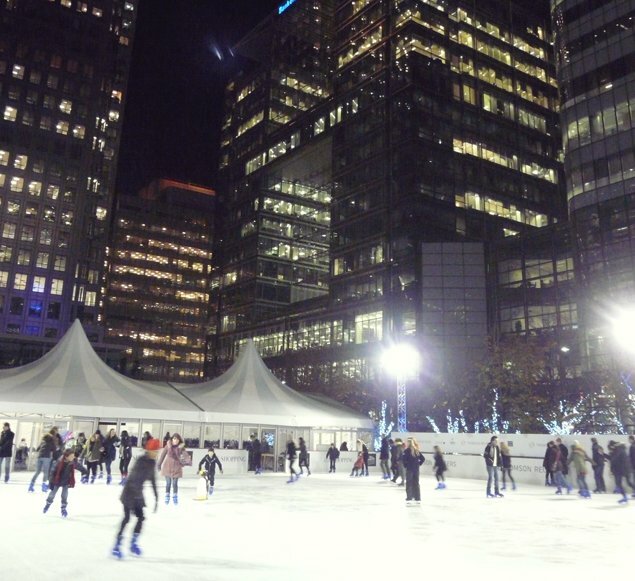 Get a head start on the festive season at Canary Wharf, where the ice rink opens on Halloween! Surrounded by glittering skyscrapers, this is London’s answer to The Rink at Rockefeller Center in New York. The pop-up bar by the rink offers the latest inventive cocktails while the neighbouring shopping mall is a great place to get a little holiday shopping done. When the weather doesn’t cooperate you can head indoors to Westfield London in Shepherd’s Bush. Within easy reach of many of our vacation rentals, the sizeable rink can accommodate 160 skaters and is complemented by a full schedule of live music performances and DJs. 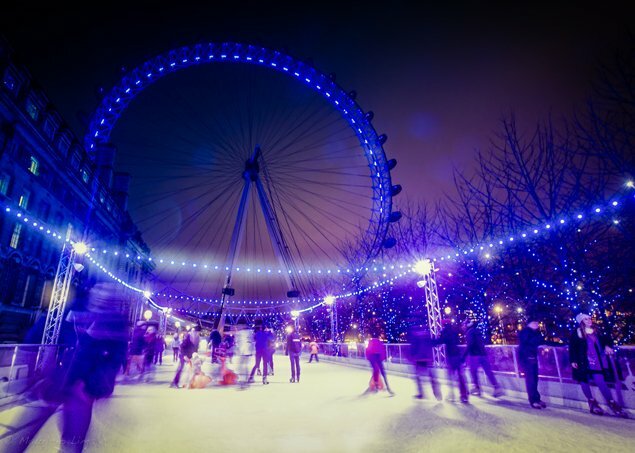 Just a stone’s throw away from the German-style Christmas Market at Southbank, the ice rink at the London Eye is the perfect way to cap off a day of shopping and sightseeing in the UK capital. Get the most out of your trip by pairing a skating session with a trip on the London Eye, which offers spectacular panoramic views of London. Find out more about Eye Skate. NEXT: A Christmas Carol Not to Miss in London this Winter! 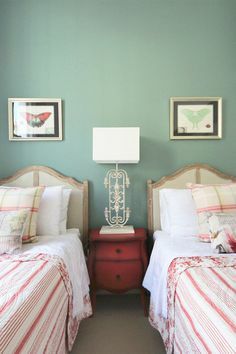 Posted on Thursday, October 22nd, 2015 at 2:53 pm in What's On. You can follow any responses to this entry through the RSS 2.0 feed. You can leave a response, or trackback from your own site.